Great for start-ups and entrepreneurs this fantastic collaborative environment is set within the heart of Kilmani, in a peaceful area of the city allowing for an elegant and serene working environment. Just a short walk from the service station and the Examination centre, this highly accessible site provides quick links to a nearby shopping centre, close restaurants and several supermarkets. In addition, your business can take advantage of the space's 24 hour access and security, allowing you to work through the hours you desire. Strategically located on Argwings Kodhek this popular location provides fantastic access to the CBD and surrounded by a choice of local amenities. In addition to offices occupied by professional tenants from NGOs, financial companies, etc., there is also a co-working lounge space suitable for up to six people. Along the same road, there is an abundance of lively bars and quality restaurants in which you can entertain and impress clients. This is a flexible, functional workspace solution for any forward-thinking company that wants to enhance their business's productivity and efficiency. These offices provide everything you need to help your business succeed. You can move in quickly and easily, with none of the traditional start-up costs. The centre is conveniently close to a shopping mall, and the city centre is just a short drive away. Boasting a vast amount of space spreading across 5 floors, this is the ideal location to create your ideal business environment. The space provides a back-up water supply and generator, allowing you to work efficiently and effectively. The space also offers an abundance of parking spaces, making your commute to work easy. The space also benefits from excellent public transport links, allowing for easy access to the rest of the city. A unique opportunity to occupy high-quality rental offices located a stone's throw away from Westlands and financial district of Nairobi. It is strategically situated on Purushottam Park which also houses other high-profile companies such as Safari.com, Erickson Kenya Limited, Rockfeller Foundation and various embassies. Excellent road access to other parts of Kenya and also enjoys good public transport especially buses. The office is set on a tranquil location, far away from the urban congestion to offer a peaceful working environment. This iconic building is an impressive venue for your base in Nairobi, and is surrounded by tastefully landscaped grounds as well as many other businesses and embassies. Located on the seventh floor, this centre offers serviced office accommodation along with a variety of support services. IT support is also available so that your systems run smoothly throughout your occupancy. The Nairobi – Jomo Kenyatta International airport is 20 minutes away. A stone's throw from Westlands' CBD, this prestigious building is newly constructed and provides easy access to major shopping malls, public transport, restaurants, banks and government offices. The business centre provides a range of solutions including serviced office suites, meeting rooms, open workstations and a boardroom. Reception services ensure your clients are greeted with a friendly, professional team. Occupying a great location close to the Chiromo/Westlands Ring Road and around 3k from the CBD, this eye-catching twin tower development is home to this 13th floor business centre set among tastefully landscaped grounds and provides serviced office space in an increasingly popular business neighbourhood. Amenities include; 24 Hour Access, Break-Out Areas, Centre Elevator, Meeting Rooms, Outside Seating Area / Terrace, Sandwich Service, Sky TV, Temp control, Voicemail, 24 hour CCTV monitoring, Business Lounge, Disabled facilities, Lounge Area, On-Site Lunch Restaurant, Secure underground parking, Smoking Areas, Vending machines, Bicycle Storage, Double Glazing, Major transport links, On-Site Sandwich / Coffee Bar, Regus Net high speed internet access, Suspended Ceilings, Videoconferencing facilities. Offering a range of executive and spacious office solution, this prestigious business centre in the heart of Nairobi near the central business district is the perfect place for professionals. You can choose from a selection of private offices, co-working options, hot-desking and virtual office solutions. Your membership includes access to meeting rooms and printing facilities. Secure car parking is available on site and with public transport links right on your doorstep the centre is well connected. This Grade A building is generator power backed, and manned 24/7 for your peace of mind. Photocopying/printing/scanning facilities are available, excellently provided by professional customer care staff onsite. Commutes to this centre are quick and simple, owing to its number of public transport links and the site's secure car park. Within walking distance, there are lots of restaurants, accommodation, a gym and several banks. This is a ready-to-work space in a stylish, open-plan offices which are designed to ensure your business can flourish with minimum hassle and maximum enjoyment. The provide all of the essential services such as printing, courier services and professional services and the team are on hand to support and help you get the most out of the space. Within the space you will have access to 4 boardrooms, each with a screen, video conferencing and whiteboard. This is the perfect workspace solution for companies that desire a functional and convenient home for their flourishing business. The office consist of a large work space with four fully equipped work stations and a large conference table. Close by, there is also an events venue where you can host conferences and conventions. High speed internet and monitors are located around the room for presentations. A sparkling new business centre in Westlands, one of the most sought after business location in Nairobi. It enjoys a good location far from the congestion of the city centre yet near to other business districts and shopping areas. Transport into Nairobi is made easy via the nearby Waiyaki Way and it is also possible to travel by buses. The centre has dedicated parking space for tenants. Inside the building, there are executive desks, leather chairs, lockable drawers and shelf spaces to create a modern working environment. This lovely centre prides itself on offering an ambiance that will impress you and your guests. There is also personalized support and friendly service from on-site admin team, secure parking, mail handling and telephone answering for your convenience. Just a short drive away, you can find The Nairobi Arboretum which offers a beautiful space in which you can relax with sprawling views of natural scenery. 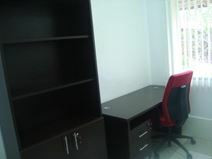 Recently constructed modernized office space is ideally located in Hurlingham. Convenient location to the nearby Serena Hotel, Nairobi Hospital and also coupled with transportation links to Valley Highway Road. The virtual and serviced offices have fully functional workspaces with efficient and high speed internet services, all backed up by a state-of-the-art security system to ensure that on-site clients and items are safe and secure. This office space is also provided with secured parking services. Located just 20 minutes from the city centre in a leafy and serene environment away from the high rise buildings of the CBD this modern office space is available on flexible 3-12 month agreements. You will also benefit from an outdoor space with a stunning garden, which can serve as a place to spend your lunch break, or for informal meetings and social networking. The centre has tight security, as well as being located opposite to the Sudanese embassy. This innovative, tech forward space is designed to boost productivity and efficiency. It will appeal to any business from creative start-ups who wish to join an interactive, community based environment to multinationals who may seek privacy and high-quality service. This is a great workspace solution for companies that value accessibility and convenience on top of a pleasant work environment. Karen has great access to amenities like banks, shops, restaurants and bars. Offering a range of office solutions in the heart of Westlands, this business space provides professionals with a comfortable and highly functional work space to thrive and develop their business. Allowing 24 hour access, you can work around the clock and at your own pace. Membership includes access boardrooms, video conferencing, networking events and high speed internet. Offices are filled with plenty of natural light to promote productivity. The area offers plenty of local amenities including public transport links. This centre is a historic location with easy access in and out of the city, and close to business areas of the city including Upperhill, Westlands, Parklands and the Kilimani area. The Center is also surrounded by many restaurants and hotels, and the view of the historic skyline from the 17th floor will remain forever memorable. A range of fully serviced office space and quality meeting rooms are available. Just a few minutes from the Nairobi CBD these stylish office suites are close to major shopping malls and residential apartments. Also available is a boardroom/training room. The site is accessible 24/7, with round the clock security so you can operate through late hours with peace of mind. It is ideal for businesses with international relations and may be required to collaborate across different time zones. This centre takes away the hassle, cost and resource of running an office allowing you to focus on your core business in a professional environment that feels more like a home than an office. Whether you are an international corporate opening an office in Kenya, or a small business just setting out, this as an office home for you. Surrounded by various amenities including major banks, hospital and a shopping mall, this serviced office space is in the heart of the Kilmani area and provides quick and easy access to both the CBD and Hurlingham and Ngon. Workspaces available in a modern building located in Kilmani, a prime location, north west and away from the hustle and bustle of the CBD. However, the CBD is still only around a 15-minute drive and the centre itself offers fibre optic Internet and furnished with quality and modern furniture. Some of the common local markets are also found nearby, such as Toi and Kenyatta markets. A commute to the airport takes about 30- 40 minutes. This is a practical and convenient workspace solution for any forward-thinking company. This business centre, opened in 2010, has 9,492 sq ft. of office space available over two floors of a building located close to the Nairobi's Central Business District. The centre offers plenty of parking, and can be easily accessed thanks to its ideal location. Within the immediate area, there are lots of cafes to enjoy during your breaks, as well as many local amenities to explore outside of work. With either private office or open plan options and an ability to expand to up to a 200-person capacity this flexible working environment is located south west of Nairobi"s city centre in the affluent suburb of Karen. This award-winning office park offers unrivalled work space for occupants, plus space for relaxing, most notably a spectacular island gazebo set on a water feature. Easy access by private or public transportation. This attractive center provides common receptionist & administrative support to all tenants as well as telephone services. Every business needs a high speed internet connection and IT support so this is available to all tenants within the space too. There is a shared printer with scanning and copying facilities within the centre as well as fresh water and mailing services that all tenants have access to. This office space is centrally located on Lenana Road in the upcoming business district of Kilimani. It is comprised of two separate wings adjoining a central area where there is a main reception, elevators, kitchenettes and break-out rooms. Each wing has its own board rooms, meeting rooms, work areas and business lounge. Hotdesk seating can also be arranged at special request. Kilimani is located within 15 minutes’ drive from the city centre and international airport, and it only takes 5 minutes’ to reach Yaya Centre, a modern shopping mall housing over 100 retail shops under one roof. With easy and convenient access to the UN offices and various embassies in Nairobi, these designer offices are furnished and fitted out to a high standard, and provide tenants with space in a prime business area of the city. The office building has security along with CCTV and Access Control System to PPBC, secure parking as well as a well-protected personalized network for the security of your data. An impressive business hub situated in central Nairobi, providing a range of furnished office-space solutions available to let on flexible terms. All work-spaces maintain good levels of natural light as well, boosting productivity for all tenants. Amenities include high-speed internet, meeting rooms, equipped kitchenette, parking and reception service. In addition, the location is ideal for aspiring tenants providing a wide range of local amenities to be enjoyed outside of working responsibilities. Transport links are numerous as well, providing convenient travel around the city. This centre is located on Muthangari Drive, in the vibrant Westlands area of Nairobi, with a multitude of services available along the adjacent Waiyaki Way. In addition to its attractive and well maintained gardens and commercially focused architectural design, the site offers much more than appealing aesthetics; including on-site management, conference and training facilities, dedicated wifi and full furnishings, all within a comfortably air conditioned working environment. Looking for office space in the upmarket Westlands area of Nairobi? Then this could be the centre for you. The office space is located on the 5th floor of a building that has security and elevator access 24 hours a day. Security is provided round the clock, 7 days a week, manned by guards and also CCTV cameras that are fully operational. This wonderful centre is close to malls, hospitals and banks. Located in the heart of Westlands these fully serviced and tastefully furnished executive office suites are located on the top floor of this five-storey building ideally positioned at the junction of Mpaka and Muthithi roads. Facilities include plug-and-play workstations and fully equipped state-of-the-art meeting and conference rooms. Transport links in the local area are also excellent, with the centre being easily accessible via road and rail; and Nairobi railway station is only a short drive from the site itself. This new business centre is located at the Vienna Court State house in North Western Nairobi, and is well situated within a corporate park featuring a number of high-profile businesses and organisations. These furnished offices can be accessed 24/7, with dedicated internet and conference facilities to stay well connected at your convenience. Aside from its stunning gardens and outer features, the site is situated within a commercial park that has been created to encompass rainwater harvesting, solar control glass and renewable energy provisions. From established corporate companies to start-up businesses this centre has ultra-modern office space to suit a wide range of small and large requirements. For instance, you can take advantage of its administrative support, CCTV security, IT support and telephone answering services. Its position on the edge of the CBD allows for easy access to both the CBD and Nairobi"s outer areas such as the Westlands area, Kilimani and Upper Hill. This building is offering serviced private offices, co-working, event space and on-demand meeting room facilities in one of Nairobi’s favourite business hubs. All these spaces are powered by fast and reliable internet. Members also get access to business opportunities, networking events, workshops, marketing support as well as access to affordable business services to support their growth. Within 5-minutes walk you have access to supermarkets, Prestige Plaza and Yaya centre shopping mall and there is ample parking with dedicated spaces at an additional charge. Away from the centre of Nairobi this business centre provides spaces suitable for a range of companies from start-ups to major international corporates. They aim to make the spaces feel more like a home than an office. 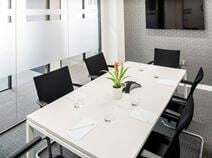 The space is comfortable, with flexible terms that include accommodating support services, such as a secretarial team with telephone answering, and 24-hour security for peace of mind. With an ideal location just off Riverside Drive, in an area that is developing rapidly, this exclusive serviced office is set in a prestigious and secluded business park. This centre provides a comprehensive range of workspace solutions and the very latest in high tech facilities. There are meeting rooms and board rooms, with 24-hour access for optimum convenience. The surrounding area offers lots of other forward-thinking businesses with which you can network. This accommodating space is strategically located on Riverside Drive, a growing business district that is very popular among corporate clients that wish to expand their global coverage. The centre offers a fantastic array of amenities on-site including; a dedicated phone line, access to printing and copying facilities, refreshments and personalised call answering among other professional services. Local transport links are excellent, with Nairobi Railway station and convenient bus services running throughout the region. 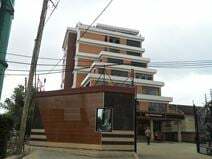 Situated on arguably one of the most Prestigious streets in East Africa; Riverside Drive, adjacent to the Australian Embassy and with a view of the uptown Westlands Skyline, this centre is conveniently placed to offer businesses the image that they would want to be associated with but at a very affordable price. The offices are easily accessible by both public and private means, and offers call answering services, mail and package receiving, furnished offices, unlimited internet access, ample parking and 24 hour security. This prestigious 6-floor building with elegant granite and marble lobbies is located in Nairobis business hub next to the UNs African headquarters. This business centre combines the best of both worlds - international business links with walking-distance access to the best of local amenities. This centre hosts a variety of services and facilities that will ensure your company thrives under impressive conditions. There are also mail handling services for your convenience, establishing a prestigious presence. On the 12th floor of this well-maintained tower in Nairobi's central business district you will find this business centre with fully serviced office space, meeting and boardroom facilities and a professionally staffed reception area to greet your clients. The center is fully serviced with meeting rooms and board room facilities available to all occupants. It is within walking distance of the University of Nairobi. This flexible and ultra-convenient workspace solution provides 24 hour security, company signage, administrative/IT support, hot desk options, conference facilities and postal services/mail handling. Pricing is all inclusive, and the site is easily accessible from any point of the city, owing to its close proximity with a number of transport links. The surrounding areas offer many local cafes, bars and restaurants in which to entertain and impress clients. 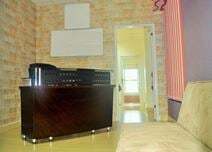 This ready to use office enjoys an unbeatable technical and complimentary services such as excellent furnishing, computer networking, lounge area, parcel services, telecommunication services, video conferencing room and also great support from technical knowledgeable staffs. Housed in the heart of business district, Nairobi with good link to major highways, airport and Railway Golf Course. This building enjoys a lovely view of main leisure park. It is also close to police station, apartments, hotels, gym and restaurants. Situated on the outskirts of Nairobi's CBD and close to the Uhuru Highway this great location is in a quieter area of the city yet still has great transport links into the heart of the CBD. 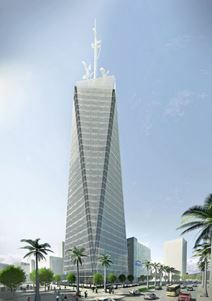 The 20-storey building offers views of the Nairobi City Park. These furnished offices come with IT support so that you stay well connected throughout the day. It has adequate underground parking, several restaurants, an barber shop and other necessary facilities within it. Situated in a prestigious building along Waiyaki Way, this serviced office centre is 5 minutes drive from restaurants, banks, gyms and more. This is a newly constructed office building offering a range of work spaces to suit your business needs. There is a project room, boardroom, focus group discussion room and training room furnished with projectors. Within walking distance, you can also reach a number of hotels where you can accommodate visiting clients and executives. 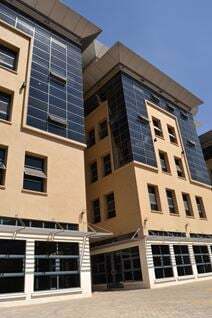 Located on Chiromo Road and away from the busy centre of Nairobi these fully-furnished offices provide lots of natural light and state-of-the-art facilities along with a number of business support services. Combining the best of office, retail and leisure space in one location, the building's modern design takes you away from the hustle and bustle of the ever busy Nairobi. You can also find a cinema and function room facilities just a short drive away. Situated on Waiyakiway in the heart of Westlands, these offices provide a prime location for business. The open plan offices are from 1500 sq. ft. in size and provide easy access to the CBD. You can reach the Jomo Kenyatta International Airport within an hour, making this a prime location for businesses anticipating international contacts, and would like a space in which they can easily impress them. Opening in February 2019, this business space is found in one of Nairobi's newest prestigious office buildings in the heart of the city. Offering premium office spaces for corporations, you can choose from private offices and coworking spaces. Offices are designed to a premium standard, with sit-stand desks, natural lighting, filing cabinets and ergonomic task chairs. The centre is located close to all local facilities including shopping malls. Close to a number of five star hotels and restaurants, and only 15km from JKIA airport these serviced offices are located on the 5th floor of this building in the heart of upmarket Westlands. There is a reception, front office and waiting area for meeting and welcoming your guests. In addition, you can also gain easy access to a meeting room, in which you can convene collaborative meetings within an attractive space. Good transport links within the centre's vicinity means the rest of Nairobi is easily accessible. A great location in the business hub of Nairobi easily accessible by both private and public transport this business centre provides serviced office space and meeting rooms on the first floor of a well-maintained tower building on Westlands Road. This centre is accessible 24/7 so you can work through late hours. This centre stands at close quarters to several museums, as well as a beautiful botanical garden where you can unwind.